No more sounds of silence – For the fainthearted . . .
A diminutive figure in a red tee-shirt and black trousers, he stood alone in a pool of light. Sixty thousand people watched each move, listened to each guitar chord, pondered each word sung. This would be the last opportunity. 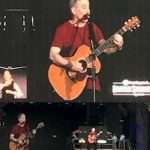 Paul Simon was making his last and final concert appearance in England and closing not with a crescendo of sound and light, but with a poetic diminuendo. The Sound of Silence, written more than fifty years ago, was his final word. Written at three o’clock in the morning on 19th February 1964, perhaps the lyrics, which express a profound existential loneliness, emerge from circadian rhythms, an articulation of the low point felt by the human body at that hour of the night. Perhaps the lyrics are an expression of an existential loneliness that comes with being human. Existentialists would have welcomed Paul Simon’s lyrical expression of the reality that confronts us. The darkness, the fear of isolation, the fear of loneliness, the fear of loss, the fear of death itself, are regarded as fears that inhibit our true freedom as human beings, freedom can only come when the darkness is confronted. The existentialist view of the feeling experienced by Paul Simon in the early hours of that February morning would be that they were a spur to authenticity. Only when we have confronted the prospect of being alone in the darkness, only when we have accepted our nothingness can we be free to live authentic lives. Reality is written in the mundane places; reality is spoken softly when there are no noises with which to mask it. 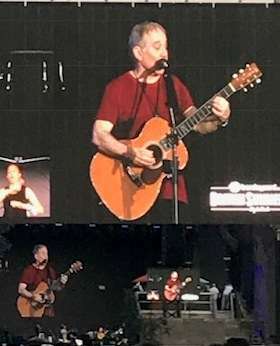 The concert finished with silence, with Paul Simon acknowledging the applause before the stage was darkened and there was no more sound. Face the darkness and there are no fears, silence itself becomes reassurance.